The other day I was meeting someone for lunch. We had agreed to meet at 12:30 at the restaurant. I managed to show up about 5 minutes early because the place is known to get pretty crowded for lunch, and decided to grab a table. At 12:45, I receive a text message saying that she is on her way from school, which was about 5 minutes away from where we were meeting. At 1:15, she walked in the door saying she was so sorry, that her mom had asked her to do something and she had to do it. Now she had a valid excuse, and she's not normally one to keep someone waiting. However this 45 minute wait got me thinking about something: Punctuality, or lack there of it. The saddest thing about this is that so many people think it's perfectly fine with being "fashionably late" to everything. Parties, meetings, hang outs, even class, so many people think it's acceptable to show up late and that there will be no consequences if they are. Punctuality is one of the most important components of professionalism because it lets the other people know you're serious. If you have a job and you consistently show up whenever you want, eventually you'll have to pay the price. If you have a big kid job and miss meetings with clients, your clients will most likely not stick around waiting for you to show up (unless you have a very good reason!). Showing up 30-45 minutes late to work, a party (that isn't a come and go party), a meeting, class, etc. does not fly most of the time. In fact, having a ton of absences and tardies in school is a great way to convince the professor that you really don't care about their class. This isn't to say that professors are insensitive to these issues. 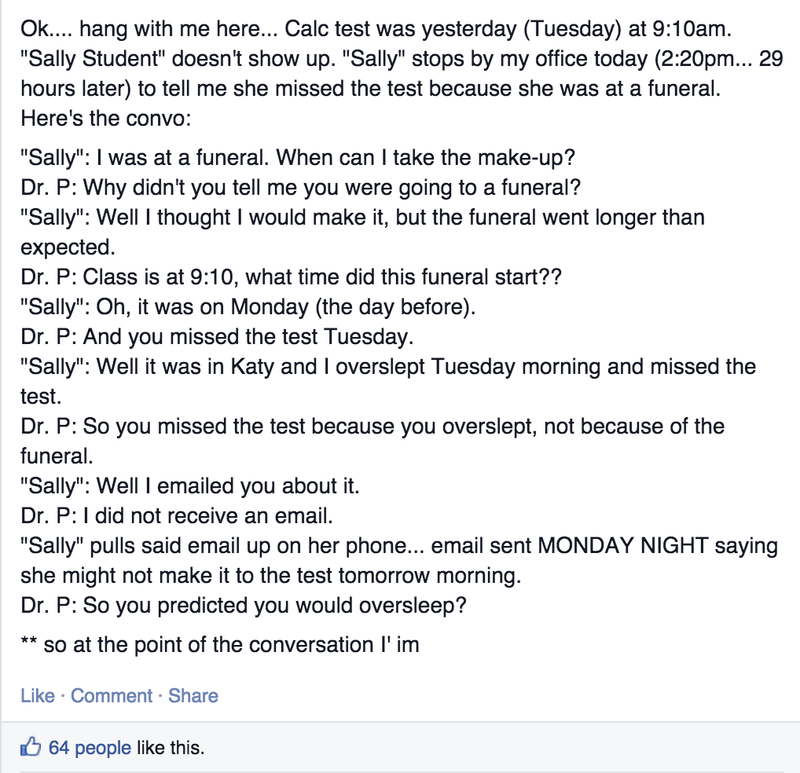 The issue here is WHEN the student finally decided to let the professor know about her absence. Had this girl emailed the professor before the funeral or even told her what was going on after class the previous class, the professor would have been able to work with the student. Instead, the student waited until after to let the professor know and just expected to be allowed to take the test. I don't know the outcome of the story, but honestly, it doesn't look good. 1. Do: be there on time! Just don't miss it! If you don't keep track of all your meetings, major assignments, classes, etc., how do you expect to make sure you're at everything? Use your agenda, whether it be a hard copy or by using technology (I use a combination of both to make sure I don't miss anything). By making sure you have it on your calendar, you'll be 100% positive that you haven't missed any major things. If something, like a funeral happens, you'll be able to see what all will be affected by it. 2. Don't: Wait until the last minute! If you are going to miss something, give the client, boss, professor, friend plenty of time in advance. Sometimes you'll get an extra credit opportunity in one class that happens during another. Talk to your professors about it, they don't want you to miss out on something that could help your grades! I also get that sometimes freak accidents happen, someone goes to the hospital, deaths and births, etc, but make sure you email your professors as soon as you find out or have a friend do it for you from your email account. You can also call your professor's office phone if that is a better way to get a hold of them. Explain the situation and know that your professor has the right to accept it or reject it. But usually the professor will understand because you're letting them know in advance. Life happens, and as long as you take care of it at the right time, unlike the student mentioned in the screenshot above, most professors will understand. 3. Do: Be honest! Honesty is key. If you overslept and missed a test, be honest. Professors, like my old one who posted the scenario above, have heard every excuse in the book. They can tell when someone is lying, and if caught, they most likely will not let that person re-take a test, an assignment or a quiz. As I said before, life happens, and it's best to be honest than to get caught in a bigger mess. Own up to your mistakes, it'll save you in the long run. 4. Don't: Think you're the exception to the rule. You're not. You are not Ginnifer Goodwin in He's Just Not That into You. Sorry if that hurts your feelings, but there are few times that it's acceptable to be late. If you wait until the last minute (and it's not a freak accident or something) to explain to someone why you'll be late or miss something, it's on you. If you lie to get out of something and get caught, it's on you. If you don't keep track of what's due and when appointments are, it's on you. You can't blame the client/professor/boss for not giving you what you want if you don't do your job. Honestly, being late or not showing up at all isn't cool. You miss out on material, your professors/bosses/friends notice, and it hurts you in the end. If you are late, make sure to take the proactive approach and get it taken care of before you miss/show up late; Don't try to do a quick clean up after.